Mitotic chromosomes are differentiated longitudinally into regions of euchromatin and heterochromatin. 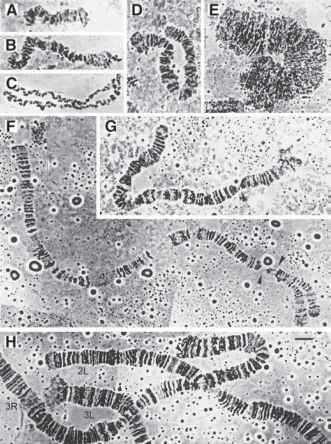 Euchromatin is the gene-rich portion of the genome that decondenses after mitosis. Heterochromatin exists in a relatively condensed state throughout the mitotic cell cycle (17-19,52), generally replicates late in the S-phase after euchromatin (53), contains few genes (e.g., refs. 54-57), and consists of mainly satellite DNAs and transposable elements (e.g., refs. 46,48,58-67). In D. melanogaster, approximately one-third of the male and approximately one-fourth of the female genomes are heterochromatic (68), including the entire Y chromosome, the proximal approximately one-third of the X chromosome, the middle 20% (i.e., the pericentric regions) of chromosomes 2 and 3, and roughly three-quarters of chromosome 4. In addition, the telomeric regions of all chromosomes are heterochromatic (69). Su(var)2-5], which in turn may recruit other heterochromatin-associated proteins to form higher-order chromatin complexes. In polytene chromosomes, heterochromatin-associated DNAs usually show reduced polyteny compared to euchromatic sequences, and they coalesce into a nuclear structure termed a chromocenter (see Subheading 4.3.). Another type of chromatin, "intercalary heterochromatin," is associated with polytene chromosomes and is discussed in Subheading 4.4.